Throughout history, Spain has been an architectural icon with phenomenal buildings and exemplary architects. From the Sagrada Familia by Antonio Gaudi (1883) to Frank Gehry’s Guggenheim Museum Bilbao (1997), Spain has attracted many architecture lovers, who want to experience in person the presence of different architectural styles in the country that has one of the most dynamic and colorful cultures in the world. It is intriguing to observe the building and landscape in Spain, considering Spain is famous for its unique Spanish Gothic and medieval architecture. Meanwhile, modernism also has become an important part of the architecture movement. The peak of non-traditional architecture was highlighted when buildings like the Gas Natural Tower in Barcelona or the Bilbao were built. At first impression, it does seem as if there are two extremes in the architecture spectrum, and questions about the “invasion” of new architecture were raised. In cities like Barcelona especially where many architectural styles exist, the borderline between old and new becomes even clearer. 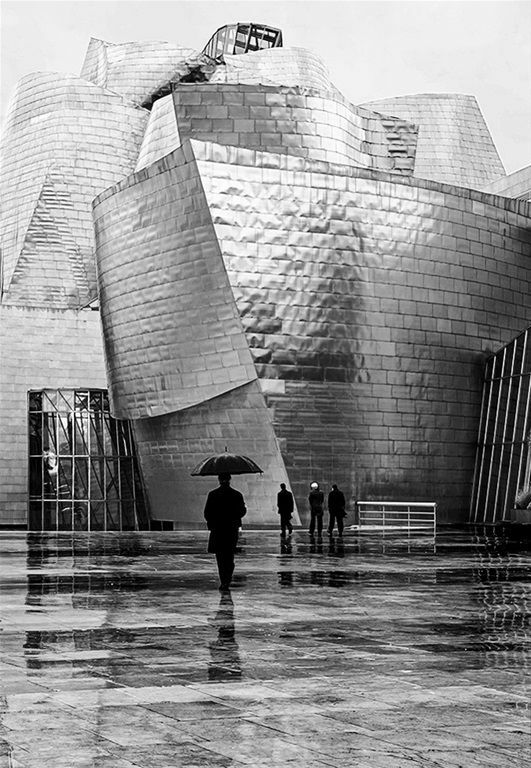 As an architecture student, I have been introduced to the thick history of Spanish architecture, impressed by Gaudi’s strange architecture, and completely amazed by Gehry’s Bilbao. To me, these two specific buildings represent Spain architecturally, a country where anyone can learn a lot about the art and the culture just by observing the change in architecture. Architecture is culture and culture is architecture. The way architecture has been tells the story of human being’s evolution in ideas, aesthetics and the way they live life. Spanish architecture, though prominent and visually impressive, has not been one of the bigger focuses in our Architectural History classes. After taking a Spanish class in the Summer semester, I have developed a better appreciation for Spanish culture, as well as a desire to travel to the country during Spring break to explore, with my own eyes, the “odd” architecture of Gaudi and Gehry. This project aims to study how much the architecture from different decades has affected the culture, the landscape, the people, and the country’s image in general. This trip will be done during Spring break of 2014 (March 15 – March 23, 2014). I will be traveling with a studio friend, who shares the same passion of architecture and traveling. This trip will be my first planned backpacking trip. During the trip, we will be traveling everyday from city to city, documenting pictures and sketches of architectural monuments. It will take about 4-6 hours of transportation (either by train or bus, depending), 6-8 hours of documentation, and 2-4 hours dedicated to blogging and edits, per day (in totally, roughly 35, 50, 30 hours respectively). I will be traveling to Barcelona, Bilbao, Valencia, Granada and Madrid (the plan might change if time does not allow). I wish to produce videos, pictures and a book as well as maintain the updates on my blog for my one-week adventure in Spain. After the trip, I hope to gain more knowledge about the architecture in Spain and how much it has impacted life there. Click HERE for a copy of my Proposal for this Experience.